The Mostar Summer Youth Program (MSYP) is a free summer educational programme that provides youth aged 14-19 from Mostar and the surrounding area with opportunities to improve their self-confidence and key skills. The programme empowers participants in their educational, social and professional ambitions, by connecting them with organisations and businesses working in and around Mostar. MSYP aspires to be a hub for youth leadership, volunteerism, and entrepreneurship. Freya Nowell: BSc International Relations, London School of Economics and Political Science. Freya is currently completing an MA in Education and International Development at University College London’s Institute of Education and works full time as Assistant Director of London South Teaching School Alliance, designing and overseeing the delivery of teacher CPD programs, school improvement initiatives and education research projects with a network of schools across and beyond London, UK. Freya is a trustee of Our Kids Foundation. Sho Igawa: B.A. International Relations and Political Science at Tufts University, now completing an MA in Conflict Transformation at the Center for Justice and Peacebuilding, Eastern Mennonite University. Vlatka Lucic: Bachelor Art History and English Language and Literature. Currently finishing her MA in Art History and English Language and Literature at the University of Mostar (Faculty of Arts). 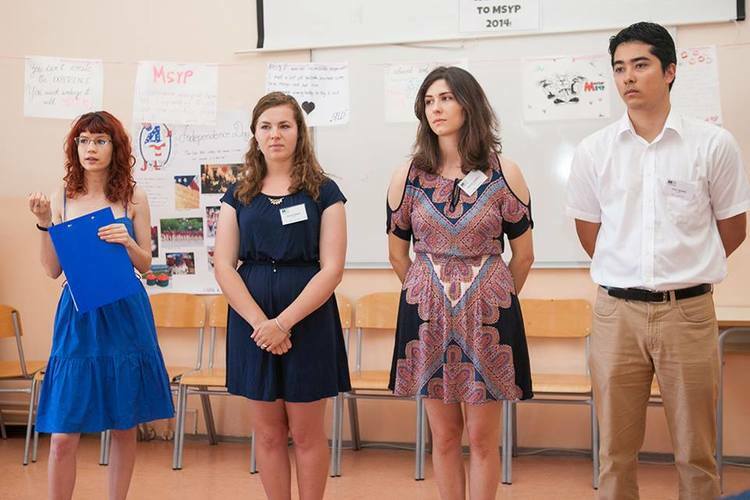 Vlatka is an active alumni of AIESEC BiH and member of the Youth Initiative for Human Rights.